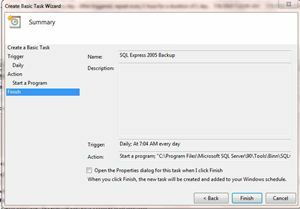 If you are looking for the way on how to perform schedule backup of your SQL Server Express 2005 in Windows 7, which has been drastically redesigned and different from , then the guide below may be one of the solutions. SQL Server 2005 Express edition is a free version of SQL Server 2005 which lacks of scheduling backups feature. 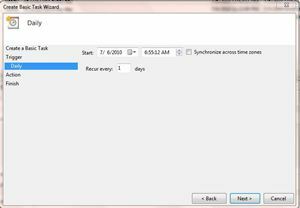 To overcome this limitation, you may use scheduled task in Windows to perform scheduling backups. 2. Create a SQL script to run the backup. 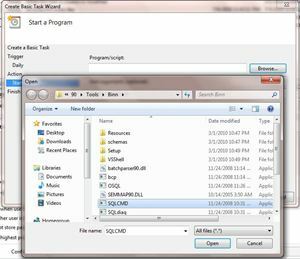 In this example, we will backup database master and saved the below SQL script as dbbackup.sql and save in “c:\Backup” folder. 3. 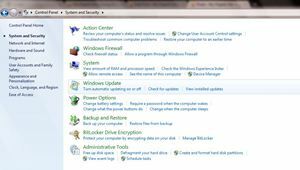 Create a scheduled task in Windows 7 which can be found in Control Panel -> System and Security -> Administrative Tools -> Schedule Tasks. 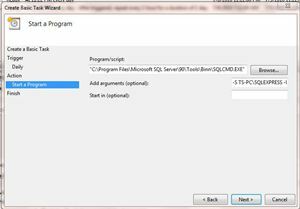 Click on “Create a Basic Task” and “Create Basic Task” wizard will be displayed. Type in “SQL Express Data Backup” in the “Name” and click “Next” button. 4. Specify when you want the task to be start (Daily), then click “Next” button. 5. Specify what time you want the task to be start, then click “Next” button. 6. 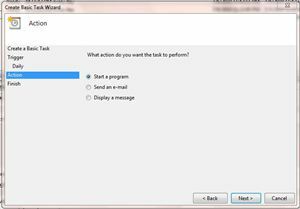 Click Start a program to perform the task, then click “Next” button. 8. Click on “Next” button to finish creating task. If you want to test the task which has been created then you can go back to the Task Scheduler, right click on the task and select “Run”.